Just like dogs, the color of a wolf's fur can vary, although gray is the most common color. Wolves may also have black, reddish or even white fur. In fact, the wolf has one of the widest ranges of color of any mammal in North America. The color helps to camouflage the wolf by allowing it to blend into its surroundings. Wolves that live in dark wooded areas, often have dark fur. In places where the plants change colors throughout the year, the wolves that inhabit the area can have fur of many shades of color. 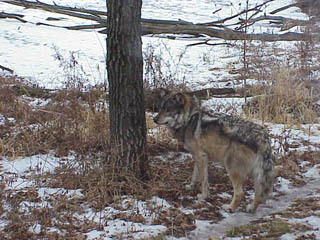 In Wisconsin, wolf fur is usually gray or brown mixed with black, white and tan. During the winter, fur gets darker on the neck and rump. Wolf pups are born with fuzzy, dark hair. As they get older, their hair lightens. 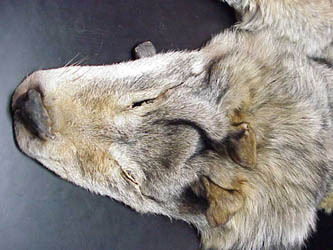 Old wolves often have gray-white hair. There is only one species of domestic dog, the Canis familiaris, even though there are more than 120 breeds of dogs. There are two species of wolf found in North America, Red Wolf (Canis rufus) and the Gray Wolf (Canis lupus). Looking at the pictures, you will notice the differences in both the color and length of fur. The Red Wolf originally lived in the southern part of the United States including Texas and Louisiana. The Gray Wolf is found in the northern states of the U.S. such as Minnesota, Wisconsin, and Montana. Wolves have two kinds of hairs. There are the long, stiff hairs of the outer coat, called "guard hairs". Wolves also have an "undercoat" of soft fur which grows thick in the winter and helps to insulate its body from the cold. This hair is shed in the spring and summer in large sheets and hunks. The outer layer of hair lies in three "capes" on the wolf's back. These hairs grow in bundles and may be nearly five inches long. Water runs off a wolf's fur, keeping its underfur dry and warm. These layers of fur may be nearly two and a half inches thick and help keep a wolf warm even in temperatures reaching 40 degrees (F) below zero. The wolf will also use its tail to keep warm in winter by wrapping it around its face when lying down. Wolves use their hair to communicate. By raising or flattening its hair, a wolf may signal aggression, anger or dominance. By holding its "hackles", or the hair on the back of its neck, stiff, for instance, a wolf signals aggression or dominance. The hair around the face can also puff out making the wolf look even larger to a possible enemy. 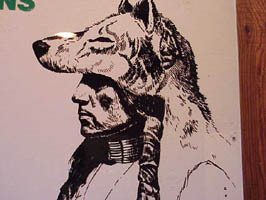 Wolf pelts were important to many American Indian tribes and considered by some to be powerful medicine. Sacred articles were wrapped in wolf skin and called "wolf bundles." Some tribes also wove wolf hair and buffalo hair together in small sacred blankets. Native American hunters used wolf pelts as a disguise to allow them to creep close to the buffalo to get a good shot. They knew that buffalo were quite used to having wolves walk among them. They did not fear wolves unless they were vulnerable because of disease, injury, or if guarding young. Wolf pelts were also valuable as clothing, objects for trade and for ruffs or coats. They were also used in ritual dances and worn by some medicine men. Return to "What is a Wolf?"